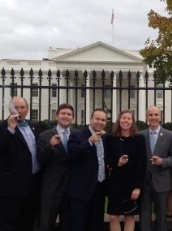 1) Representatives of the International Premium Cigar & Pipe Retailers Association (IPCPR) and Cigar Rights of America (CRA) this week met with the White House Office of Management and Budget about the looming threat of regulation of premium cigars. “The high-level meeting helped focus attention on the economic needs important to cigar retailers, including: in-store humidors, self-service displays, seasonal releases and special editions, access to financial capital, sampling events, age verification, and preserving the cigar store experience,” according to the IPCPR. “IPCPR expects FDA regulations on premium cigars to be released for public comment within the next few weeks.” Such regulation is expected to deplete cigar innovation, render limited edition smokes more difficult to produce, stifle cigar advertising, and impose burdensome testing requirements on cigar makers. 2) For the time being, the so-called Marketplace Fairness Act has stalled in Congress. This bill, which would require online retailers to collect sales tax, was being closely watched by the cigar industry. The major online cigar retailers were obviously against it, while many brick-and-mortar tobacco shops were for it, arguing the law would level the playing field. Many expect the bill to be revisited in the foreseeable future. 3) Inside the Industry: While previously disclosed, Altadis USA formally announced its new RyJ by Romeo y Julieta cigar this week. The blend is different from other Romeo y Julieta blends as it is a Nicaraguan puro rolled in Honduras. According to the announcement, the cigar uses “a special wrapper cultivated and grown exclusively for RyJ,” double binders from Estelí and Jalapa, and filler from Estelí and Jalapa, including from the storied La Mia farm (in Jalapa) which was once controlled by then-Nicaraguan dictator Anastasio Somoza. The cigar will come in three sizes: Piramide (6.1 x 52), Toro (6 x 52), and Bully Grande (5 x 54). They will retail for $8-8.75. 4) Deal of the Week: Cigar Place has a bevy of discount codes available. One particularly good deal is on the Liga Undercrown Corona Viva, our favorite size of the Undercrown blend. After you add it to your cart, add the promo code “liga” to knock the price down 15% to just $104 for a box of 25.